The main tenet of the Bush Doctrine was the policy of preventive war—using the U.S. military to attack and destroy enemies the administration deemed dangerous, rather than using force only when the United States is clearly threatened. As a senator and presidential candidate, Barack Obama was critical of President Bush’s war policies. But as president, he has embraced and extended the Bush approach to national security. According to the website Save Social Security, President Obama has increased military spending, expanded the war in Afghanistan and increased drone attacks in Pakistan. (The CIA carries out drone attacks under a classified budget separate from defense spending. The Brookings Institute has estimated that 10 civilians are killed for every “terrorist operative.”) He has bombed Yemen and Somalia, and started an undeclared NATO war in Libya. Obama has also increased the use of contractors and mercenaries, which disguises the actual numbers of American forces remaining in Iraq and Afghanistan. While corporate Democrats and Republicans are suggesting cuts to Social Security and Medicare as a way to reduce the deficit, there is little discussion among them, or from the White House, about reducing defense spending. It has always been the “sacred cow” of the budget process. However, a more accurate description might be the “corporate cash cow of permanent war.” There may be talk of reducing waste and improving efficiency, but never any real interest in dramatically cutting defense spending. it’s no mystery that corporations and businesses that benefit from increased defense spending help fund political campaigns, and are rewarded for their contributions with lucrative defense contracts. Senators and congressmen continue to push for more defense spending for contractors in their states or districts. The bloated defense budget that funds America’s adventurous wars benefits not only contractors, but also corporations who want unfettered access to markets and raw materials. For example, the new military bases president Obama built in Columbia in 2009 were built, supposedly, to aid in the war on drugs. But, in reality, they serve as a southern launching pad for eventually overturning socialist leaning Latin American countries deemed unfriendly to U.S. corporate interests. In other words, no one in either party in Washington, except for a few progressive Democrats and Independents, wants to have an honest discussion about the real purpose of defense spending, because it has more to do with corporate profits than defense. President Obama’s national security policy is disappointing to those of us who voted for him, because we assumed he would keep his campaign promises to rein in defense spending and bring home the troops.. When we desperately need money for domestic uses—for a jobs program, better public education and health care, alternative energy, elder care, and repair of our aging infrastructure—we have taxpayer money being spent to feed a bloated military/security complex that does nothing for working families. The poor, working and middle classes need jobs that are well paying, meaningful and make a positive contribution to society. But what about all those jobs the defense industry provides? 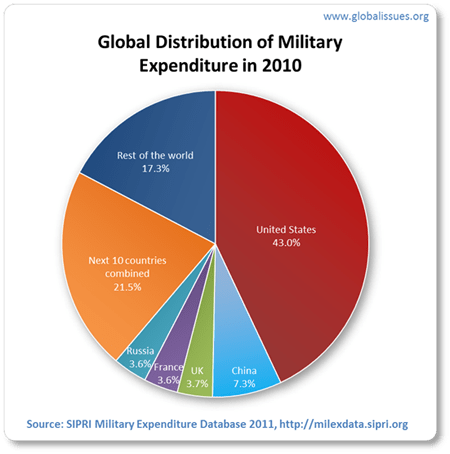 According to a study conducted at the University of Massachusettst, spending $1 billion on personal consumption, clean energy, health care, and education will each create significantly more jobs within the U.S. economy than would the same $1 billion spent on the military. Whether the most accurate total is 900 bases, 1,000 bases or 1,100 posts in foreign lands, what’s undeniable is that the US military maintains…an empire of bases so large and shadowy that no one —not even at the Pentagon — really knows its full size and scope . . . The U.S. government’s funding of right wing dictators, such as ex-president Mubarak of Egypt, is an important, yet often overlooked, aspect of defense spending. Money given to these client countries as “aid” comes with a purchase order attached—usually for fighter jets, tanks or weapons—which is sent back to defense contractors to fulfill. President Obama’s first defense budget, including the Iraq and Afganistan supplemental funds for fiscal year 2010, was $685.1 billion, an increase of 3 percent from the previous year. The Obama administration again increased spending in FY 2011, requesting a base budget of $548.9 billion, plus $159.3 billion for Afghanistan and Iraq, for a total of $708.3 billion. For fiscal year 2012, the President has requested $670.9 billion—but he raised the Department of Defense baseline request from $548.9 billion to $553.1 billion. The overall decrease comes from a projected cut in operational costs for the wars in Afghanistan and Iraq. According to the Congressional Research Service, Afghanistan [in 2012] will still cost $113.7 billion compared to the $43.5 billion spent in 2008, President Bush’s last year in office. Iraq will be much cheaper than before, but this decline was already in the works. In late 2008, President Bush signed an agreement setting the Iraq drawdown in motion. If anything, Obama has slowed down the withdrawal, and is now petitioning Iraq to stay past 2011. Meanwhile, the stepped-up war in Afghanistan has offset much of the savings we could have expected in Iraq. And this is just the financial cost. Last year 559 American troops died in Iraq and Afghanistan—significantly more than the 469 who died during Bush’s final year in office. And, often forgotten, there are untold numbers of innocent men, women and children in the countries we have bombed or invaded who have been killed, and hundreds of thousands more displaced. The suffering caused by U.S. war policy, both here and abroad, is tremendous. It is unconscionable—and unnecessary.